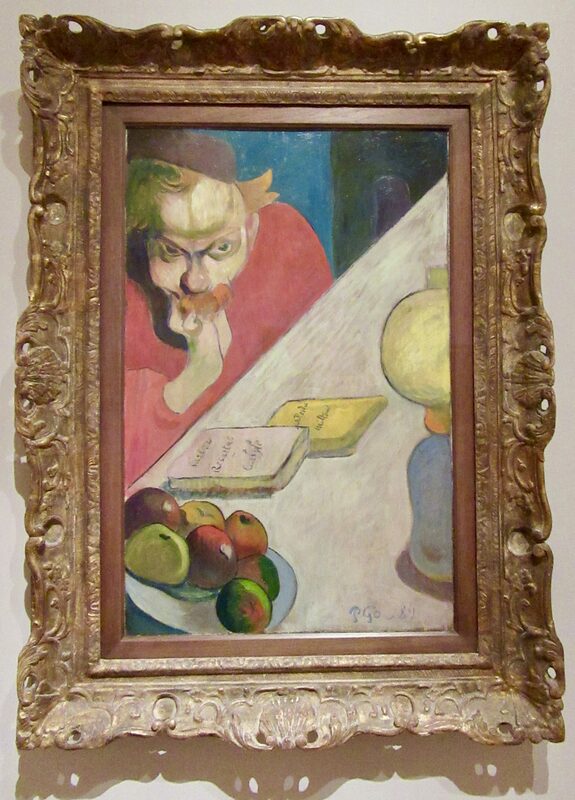 This portrait from 1889 depicts one of Paul Gauguin’s closest friends, the Dutch painter Jacob Meyer de Haan, in the pose of a thinker. The painting includes two books that reflect Meyer de Haan’s preoccupations with religion and philosophy: John Milton’s Paradise Lost and Thomas Carlysle’s Sartor Resartus. Carlysle’s central character is called Diogenes, after the Greek philosopher who searched by lamplight for an honest man, and the prominent lamp shown here may extend the reference. This work was originally intended to form part of a decorative panel for the door of an inn at Le Pouldo — a small coastal village in France where both artists stayed — and was to be hung next to a companion self-portrait by Gauguin that is now in the collection of the National Gallery in Washington, DC.